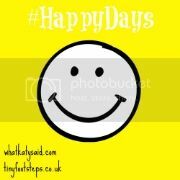 I had an unplanned break from Happy Days last week – we were away and I thought it would be a good opportunity to relax in the evenings rather than furiously blog away. But I’m back this week! It seems to have been quite a short week so I’ll get straight onto it. We spent the weekend with Granny and Grandad, and although the weather wasn’t great we still had lots of fun and Rosalie provided much entertainment. I’ve already written about our weekend away so I won’t say anymore here. We came back on Monday after seeing some friends, and on Tuesday we had Jolly Babies. After the May half term Rosalie and some of her buddies that are a similar age are going to be moving up to a new class which will be halfway between Jolly Babies and Music with Mummy – we’re quite excited about that! Thursday was our fourth Wedding Anniversary – I’m not too sure where those four years have gone, our lives are so different now! Jim took the day off work and we had a family lunch out at our local American style diner! We’ve been wanting to go there for ages but haven’t got around it, and this seemed like the perfect opportunity. 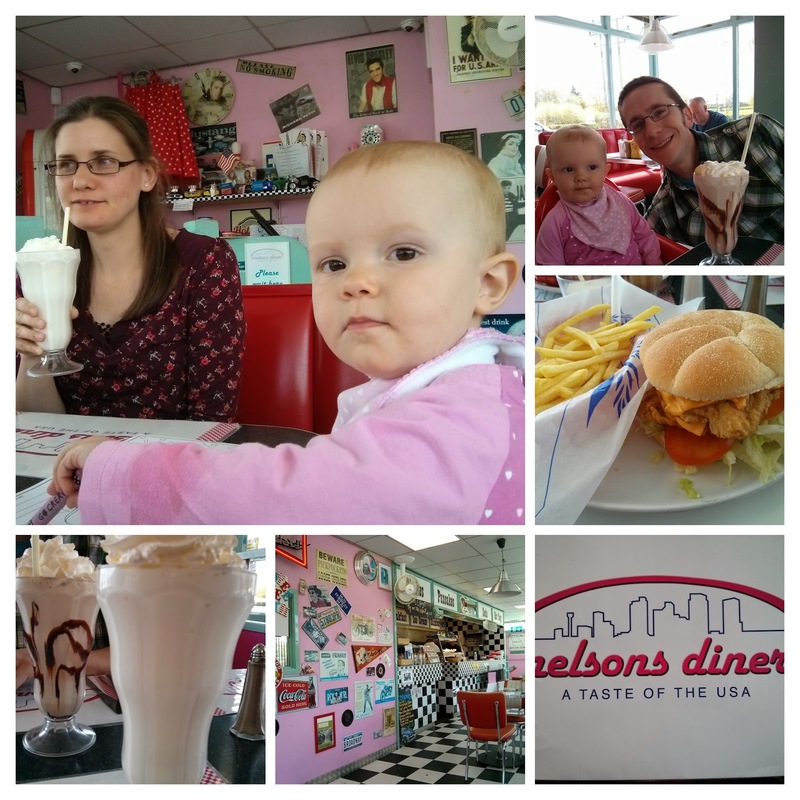 The food was amazing, and Rosalie had her first ever paid-for meal out – a mini dog and milk. Jim and I both love fifties and sixties american culture so we had a blast looking at all the memorabilia on the walls. We’ve not really been at home a whole lot this week, and when we have it seems to have mostly consisted of doing laundry – rock and roll! 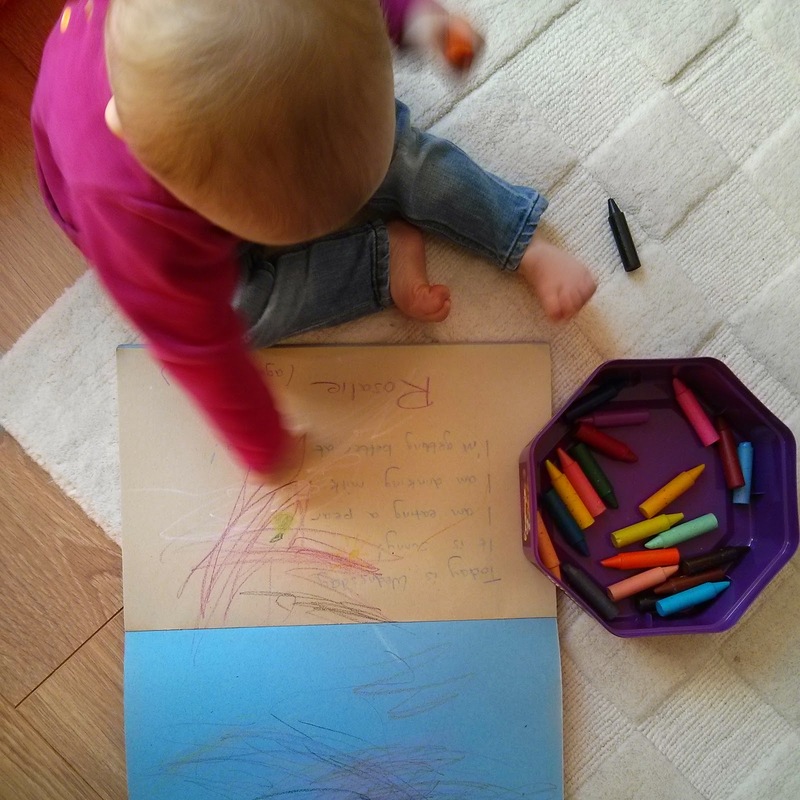 Rosalie is really getting into her colouring now, and loves to have a good old scribble with her wax crayons. The photo is blurry due to the speed at which she moves the crayons across the paper! As it was our Wedding Anniversary this week we thought it was high time we had a date night. We haven’t spent time alone together outside the house for over 16 months! So on Wednesday we put Rosalie to bed, leaving her in the hands of my sister, and went to the cinema to watch the new Avengers movie. We scoffed so much popcorn, it was brilliant, just what we needed. It’s a hard call between the cinema with Jim and lunch with Rosalie there too. I think they’ll both have to be my happiest moments. We also had a blast taking our Me & Mine photos in the garden. Ah Happy anniversary. That diner looks amazing, Steve really wants to see the Avengers so we will have to have a date night soon. Rosalie looks like she's having a fab time colouring in, Oliver started showing an interest at the same age. Happy belated wedding anniversary 🙂 – hope you have a lovely bank holiday weekend. What a lovely way to spend your anniversary. That diner sounds great and Rosalie looks like she's having a great time on her first meal out. Ah Jess – lovely to have you back and with such a happy week too. I'm glad you and Jim had a lovely anniversary. The american style diner sounds ace.